This sheet of sections of the human head continues the investigations of the Skull Sectioned drawing of 1489. The main focus of the sheet is the layered structure of the scalp, skull and brain. 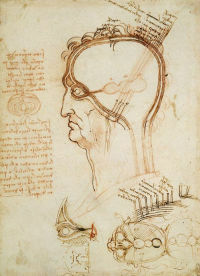 In the main study, a male head seen in profile section, Leonardo illustrates the conventional notion of three “ventricles” contained within the brain connected directly to the eye which contain a spherical “lens”. The conception illustrated here that the eye is a geometrically constructed unit that communicates directly with the imprensiva (receptor of impressions), the sensus communis (confluence of the senses), intellect and memory is dependent on the traditional idea of how sight and the brain functioned. The system as Leonardo illustrates it emphasises the priority of sensory perception and the supremacy of sight over the other senses. The note in red chalk on the left compares the layers of the skull and the brain with the skins of an onion, which is illustrated in section. Below the main drawing is a section of the head showing the layers of the scalp, skull and brain, a section of the eye, and the head as seen from above. The layers of the skull are recorded as “hair, scalp, lacterous flesh, pericranium, cranium, pia mater, dura mater, brain”. The dura mater and the pia mater have been given in their correct order in the upper diagram, but here they are reversed.